Heartland Honor Flight is proud to be one of the two Honor Flight hubs in the KC Metro. While we support the efforts of every nation-wide hub to get all of America's vets to D.C., Heartland Honor Flight is not affiliated with Honor Flight Network of Kansas City. (For more information about other hubs in this region, please go to www.honorflight.org.) 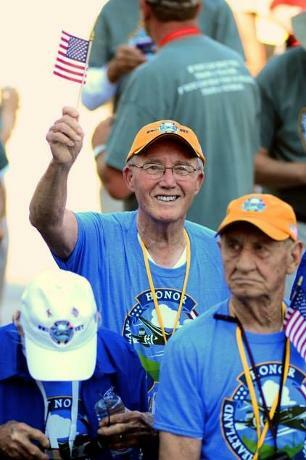 Heartland Honor Flight was the first to fly WWII Veterans in the KC Metro area, organized in 2008 by Gary Swanson and Mark Martin. Both still actively serve on the current HHF Board of Directors. order to be considered for a flight. Honor Flight Network is a non-profit organization created solely to honor America's veterans for all their sacrifices. We transport our heroes to Washington, D.C. to visit and reflect at their memorials. Top priority is given to senior veterans, World War II survivors, along with other veterans who may be terminally ill.